The 2011(5771) Jewish Passover holiday began at sundown on April 18 and continues until sundown on April 26. The Passover holiday honors the exodus of the Jews from Egyptian slavery under the leadership of Moses. Personally, I consider the exodus story a core part of Western mythology and a story everyone, Jewish, Christian, Muslim, atheist, contrarian...ought to honor! Last year we attended the Bar Mitzvah celebrating the coming of age of one of our favorite youngsters. I lobbied to acquire a fine edition Haggadah as the perfect gift, but my suggestion was overruled due to cost, at the time. The Haggadah is a necessary part of every Jewish household and it is where the story of the exodus is told and sacred text of the Passover holiday is found. With Passover this week and a Bat Mitzvah on the horizon for us, I decided to re-visit the special edition Haggadah I favored last year and look into the general marketplace of fine edition, illustrated Haggadah. A quick search provides a list of 4030 copies of the Haggadah for sale in the used and collectible marketplace with prices ranging from $1.00 to $56,900! The top spot on the list is held by the Szyk Haggadah, illustrated by Arthur Szyk (1894-1951), a Polish Jew who luckily escaped the madness of the Holocaust and World War II, was a master book illustrator who, through his illustrations, fought tirelessly against Hitler and the Nazis and for universal religious tolerance and racial equality. The Szyk Haggadah was first published in England, 1940, by Beaconsfield Press in a limited edition of 250 copies and $56,900 is the asking price for the only copy currently for sale. In 2008, the rare book dealer, Historicana, Burlingame, California, brought out two facsimile editions of The Szyk Haggadah. 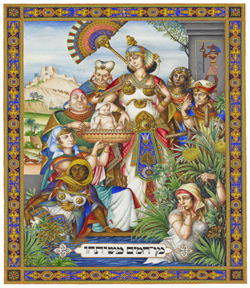 The Deluxe and the Premiere Edition of the Szyk Haggadah are wonderful limited edition publications with a price to match. The Deluxe, 250 copies were orginally printed, retails for $8,800 and the Premiere Edition, limited to only 85 copies, retails for $18,000! For a more reasonable amount I created a list of 485 copies of the Haggadah priced between $95 and $600. While I have not browsed all of the copies available within that price range, I did browse enough to know that some fine, collectible, gift-worthy copies, are included. There are numerous facsimile editions on the list and while they may not be practical, fine facsimile editions of famous old manuscripts are a treasure! In fact, Harvard University Press has just released The Washington Haggadah, a facsimile of the Haggadah created during the 15th century by scribe and illustrator, Joel ben Simeon, which now resides at The Library Of Congress in Washington, D.C. The copy of the Haggadah I was eyeing last year was a new edition published by Assouline Press in 2008. Haggadah, Special Edition, by Marc-Alain Ouaknin, illustrated by Gerard Garouste, in a Cloth-covered presentation box, 10.75 x 15.5", 11lbs, 280 pages, 150 illustrations, seems like a wonderful new edition. Do visit the Assouline page for the book where you can take a tour which isn't possible to display here! Assouline is asking $550 for this edition but it is possible to find lower prices for at either Amazon or here. It seems to me that a fine copy of the Haggadah would grace any library and I do expect to acquire one or two myself. To all, Happy Passover. The particular file could be deemed worthless when the move on cannot get the ideal task that he/she features researched. It's more painful when the managed to graduate scholar detects they are a whole lot worse away as compared to after they started out higher education. Autograph an article is both an art and a science as it necessitates a absolute appearance of writing, afterward the basal rules and norms of language, grammar, book agreement and alongside to it, is an art of presenting account and thoughts in a articular address which makes a allusive consequence on the clairvoyant by its actual accordant assuming of thoughts over the topic. Science is a systemized anatomy of knowledge. It relates to the facts and abstracts which can never be biased and accept accepted applications.http://bestassignmenthelp.org/ comprises of an accomplished accountable amount which is tested, able and experimented over the years to accord it a accurate form.